Updating several tasks at once is possible with the bulk task updating feature. Just click on the Select Button on the the top right hand corner of the WorkFlow to select tasks. Once selected, you can perform the same action across all the selected tasks, such as bulk edit or moving all cards across the columns. 1. Clicking on the Select Button on the top right hand corner and then click on as many tasks as you want. 2. Hold the Shift Button (PC) or on the Command (Mac) on your keyboard and then select the desired tasks. 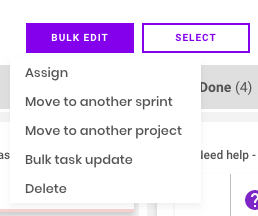 Once selected, these tasks can be dragged over to a new column or edited, by clicking on the Bulk Edit Button on the top right hand corner. To unselect tasks, just click on the Select Button.